The client libraries also provide a set of admin functionality that is typically used server-side (in a trusted environment) to manage all devices and push notification delivery and subscriptions. You can find out more in the push admin documentation. In this section, we will run you through all of the features that a push notification device has available to it. Before you can configure your devices to receive push notifications, you must first enable push in your Ably app by adding the third party push service credentials and/or certificates to your app push dashboard. 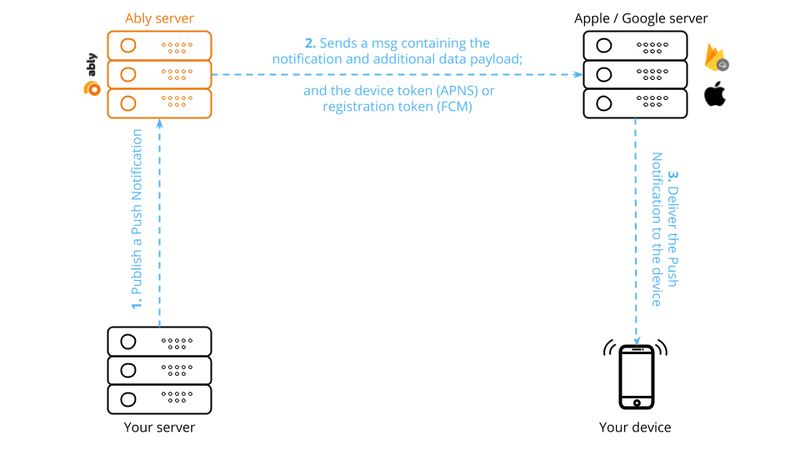 These credentials are then used by Ably to authenticate with the respective third party push service (such as APNs) and delivery all queued notifications. If you have not already done so, you can sign up for a free account with Apple’s Push Notification service and Google’s Firebase Cloud Messaging service. Whilst platform installation is platform-specific, all subsequent Ably API calls are generally portable. Be sure to choose a language above that you wish to see the documentation and code examples in. Before you can activate your push device or receive push notifications, you must first plug in Ably to the underlying OS or platform. Once Ably is plugged in, all subsequent API interactions you have will be with the Ably Realtime library API which is as consistent as possible across all platforms. By providing a consistent API interface across all platforms, we aim to ensure implementation is simpler and more predictable regardless of the platform you are integrating Ably with. As with any Firebase-enabled app, you need to include one or more services within your app to handle interactions with Firebase. You need to have a service that extends FirebaseMessagingService (and overrides onMessageReceived()) in order to handle incoming push messages; the code that handles incoming push messages does not need to interact with Ably in any way. The second requirement is that your app integrates with Firebase to handle registration token notifications, and these notifications do need to be passed to Ably; the registration token is used by Ably’s servers to be able to push messages to each specific device. You can be notified of token updates either be by overriding onNewToken() in your derived FirebaseMessagingService, or by overriding onTokenRefresh() in a service that derives from FirebaseInstanceIdService. A convenient way to do the latter is to extend AblyFirebaseInstanceIdService; in this case your service’s parent class handles the token update, so you do not need to do anything other than ensure the service is activated. You should now have a couple of methods: application(_:didRegisterForRemoteNotificationsWithDeviceToken:)application:didRegisterForRemoteNotificationsWithDeviceToken: and application(_:didFailToRegisterForRemoteNotificationsWithError:)application:​did​Fail​To​Register​For​Remote​Notifications​With​Error:​. ARTPush has two corresponding methods that you should call from yours, passing to them also an ARTRealtime instance, configured with the authentication setup and other options you need. // Set up options; API key or auth URL, etc. In the following example, we will both activate the device with the underlying platform and register the device with Ably from the device itself. 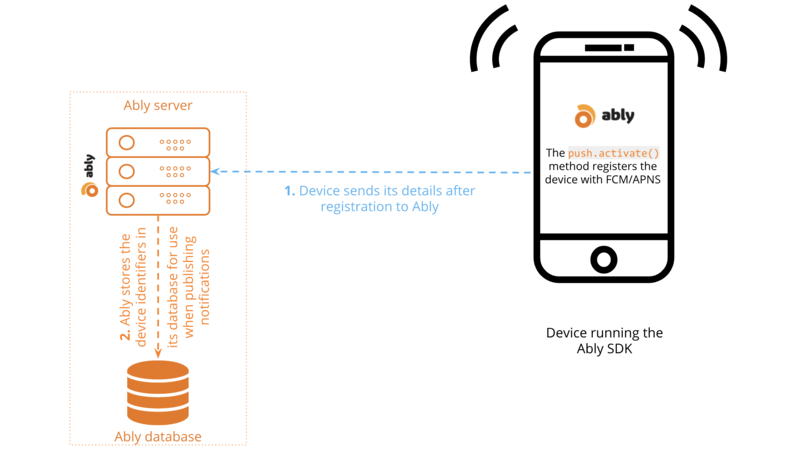 Store the deviceIdentityToken from the response from Ably in local storage so that subsequent requests to Ably to update push recipient details are authenticated as being from the device in question. Please note that the effects of calling activate outlives the current process. Once called, the device will stay registered even after the application is closed, and up until deactivate is called. activate is idempotent: calling it again when device is already activated has the sole effect of calling its callback. Please bear in mind that in order for the client to register itself automatically with Ably, it needs to be authenticated and have the required push-subscribe capability. If you would prefer to delegate registration of the push device to your own servers and not allow devices to register themselves directly with Ably, then see the section how to register devices from your server. You can also check our recommendations for choosing either registration strategy. Once activate is called, the aforementioned activation and registration process kicks off in the background. Once completed, a callback will be invoked if registered. We recommend you set up this callback so that you will be notified when push activation has succeeded or failed. Once the device has successfully been activated, you can then start subscribing for push notifications on channels and receiving push notifications via Ably. // Subscribe to channels / listen for push etc. Before you subscribe to a channel for push, make sure its channel namespace is configured to explicitly enable push notifications. By default, push notifications on channels are disabled. There are two ways a device can be subscribed to a channel: directly by its device ID, or indirectly by its associated client ID. A device ID uniquely identifies a device within Ably’s services and is assigned automatically at the time the device is activated. If your client doesn’t have the push-subscribe permissions, you should communicate the device ID to your server so that it can subscribe on the device’s behalf. You can find your unique device ID at ARTRealtime.device.idAblyRealtime.device().id. The server must then use the push admin API to subscribe the device. When a device is registered, it can be associated with a client ID. AblyRealtime.push.activateARTRealtime.push.activate takes the client ID from the AblyRealtime instance. You can subscribe all devices associated with a client ID to a channel in a single operation; that is, create a subscription by client ID. New device registrations associated to that client ID will also be subscribed to the channel, and if a device registration is no longer associated with that client ID, it will also stop being subscribed to the channel (unless it’s also subscribed directly by device ID). Alternatively, if you want to subscribe a different client ID not currently associated with the currently authenticated realtime instance, you can use the admin API. push-subscribe: Register and deregister the local device, and subscribe and unsubscribe the local device to channels for push notifications. push-admin: Register, update and deregister any device registration, and subscribe and unsubscribe to channels for push notifications. 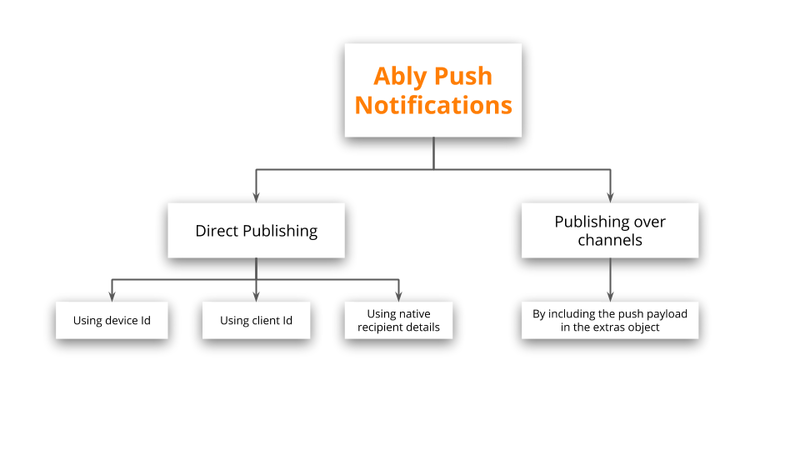 Publish push notification using the POST /push/publish endpoint (AblyRealtime.push.admin.publish method). Typically, client devices subscribing for push will either have push-subscribe privileges or delegate operations to a server with push-admin privileges. 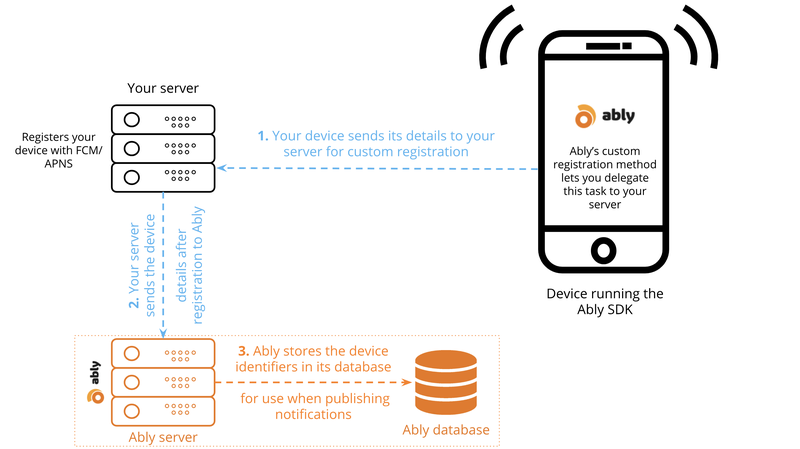 The default for AblyRealtime.push.activate is to register the device with Ably directly from the device, but you can instead delegate that to your server. Don’t forget to register the device using the push admin API in your server. For this, you need to communicate back and forth with the Ably library via the application’s LocalBroadcastManager. First, make sure you pass true as the useCustomRegisterer parameter to activate (and for deactivate). Two options for registering devices gives you the flexibility to implement push notifications in the best way for each use case. Direct registration means less server side code as the device registers itself and attaches to a channel. However, this means you need to trust your devices to handle this securely and efficiently. Token authentication solves this. If you want to control all of your devices server side then registration via server is the way to go. The Ably Push Admin API lets you do this. Register the device for push. When the activation process is completed, Ably will send a broadcast through the application’s LocalBroadcastManager. Success or failure will be broadcast through io.ably.broadcast.PUSH_ACTIVATEcall the (void)didActivateAblyPush:(nullable ARTErrorInfo *)errordidActivateAblyPush(error: ARTErrorInfo?) method from the ARTPushRegistererDelegate. Deregister the device for push. When the deactivation process is completed, Ably will send a broadcast through the application’s LocalBroadcastManager. Success or failure will be broadcast through io.ably.broadcast.PUSH_DEACTIVATEcall the (void)didDeactivateAblyPush:(nullable ARTErrorInfo *)errordidDeactivateAblyPush(error: ARTErrorInfo?) method from the@ARTPushRegistererDelegate@. A PushChannel is a property of a RealtimeChannel or RestChannel. It provides push devices the ability to subscribe and unsubscribe to push notifications on channels. Subscribe your device to the channel’s push notifications. Subscribe all devices associated with your device’s clientId to the channel’s push notifications. Unsubscribe your device from the channel’s push notifications. Unsubscribe all devices associated with your device’s clientId from the channel’s push notifications. On failure to retrieve message history, err contains an ErrorInfo object with the failure reason. On success, the returned PaginatedResult encapsulates an array of PushChannelSubscription objects corresponding to the current page of results. PaginatedResult supports pagination using next and first methods.